AllMyTube is an application designed by wondershare for devices running on iOS platform to download free video online. The AllMyTube app lets you download videos from YouTube, Facebook, Vimeo and 10000+ different popular websites.This is an unbiased review of the AllMyTube app for iOS devices and we will help you decide whether you should spend your small bucks on AllMyTube or not. Couple of months back YouTube introduced a new download button in their YouTube app that allows you to take the YouTube videos offline but there are many drawbacks in their download button. You can’t share the videos that you take offline using the YouTube app, some part of the videos is re-downloaded in every 28 days for reason unknown and you can’t share the YouTube videos that you downloaded using the YouTube app with other devices. All necessary features that you struggling to get in YouTube App, AllMyTube provides all those features in their premium package. Downloading YouTube Video was never so easy until AllMyTube made it.So, below are some of the key features of the AllMyTube app that provide an alternative option infront of users who looking for effortless video downloading experiences. AllMyTube lets you download YouTube videos in your desired quality but it doesn’t stop there, you can even download videos from Facebook, Vimeo, Dailymotion and 10000+more popular sites. You can take almost every video offline that you watch online on your devices. 1. Batch download is one of my most favorite features of the AllMyTube app. What Batch download does is it lets you make the group of YouTube playlists & channels so that you can download the whole playlist of a certain artist or genre at once or all videos of a channel at one tap at High Speeds. 2. You are getting free video converter with the AllMyTube that will be built in. You can convert downloaded videos to any desired format that is suitable for your device in no time with the built in video converter. The output supports videos to 150+ formats and you can convert any downloaded video into your desired quality for iPhone or Android smart phone. 3. When you are not able to download the targeted video then screen record feature comes in handy. It allows you to record the live screen of your device and you can use it to download videos from Netflix and Hulu. You can also make a tutorial video with AllMyTube. 4. Wondershare claims that the download speed of videos being downloaded on AllMytube app are three times faster than the usual speed of other similar applications. I myself found that the download speed is much higher than ordinary, even faster the YouTube videos streaming so I would say their claim is not false. 5. The download button on the YouTube app on your smart phone does not let you download videos in full high definition but with AllMyTube you can download the videos in all formats including 1080p HD and 4k videos and even 3D YouTube videos and YouTube high bit-rate MP3 are just one tap away. 6. After the download is complete, convert the files into your desired quality and format that is compatible with the desired device you want to play it in. Create your playlist of full high definition mp3 songs by converting song videos in mp3 files. 7. With AllMyTube you can transfer the downloaded videos and all the downloaded media files to other iOS devices without even connecting a data cable. You also get a built in video player to play the downloaded media files in the app itself. 8. AllMyTube is Compatible with almost every browser such as chrome, Firefox and also internet explorer. 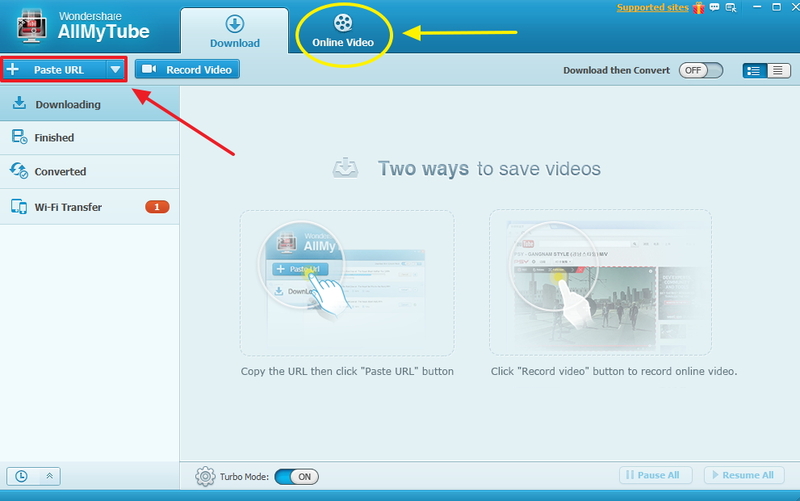 You can copy the URL of videos from websites and paste in the AllMytube downloader and initiate downloading without any hurdles. The initial price of AllMyTube starts at $ 19.00 and I would it’s a steal, if you want an App that can download online videos at high speed, this is the app you are looking for. Thanks for your valuable time which you shared while reading this review. Kindly leave your views and experiences regarding AllMyTube in below comment section,we will be happy to hear from you.